I don’t know about you, but I love lemons….the fresh smell when you cut into one….and the tart, zippy taste they provide to recipes. They’re so enlivening! That they have so many health benefits is just icing on the cake. A wonderful self-help health aid in a shiny yellow package! Lemons are certainly one of cheapest, and yet best, things you can do for your health. This common citrus fruit has uncommon abilities, and is a virtual powerhouse, with great cleansing and health-giving properties. 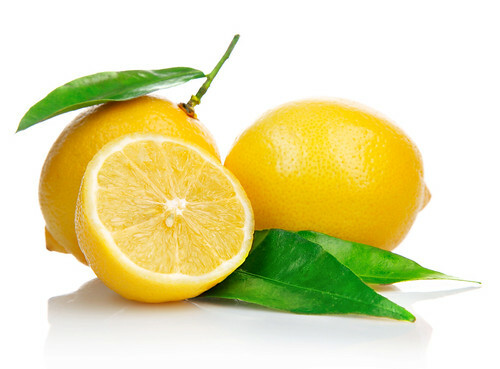 Astringent in nature, lemons have an overall alkalizing affect on the body, even though they are acidic. They are also a great source of trace minerals, have the ability to suppress sharp rises in blood sugar, and are the most electrically charged of all fruits. Plus, lemons not only contain vitamin C, but also unique flavonoid compounds that have anti-oxidant and anti-cancer properties. And apparently the more seeds a lemon has, the better, because supposedly seedless fruits are lower in life force energy. It’s no accident that the lowly lemon is a key ingredient in the Master Cleanse, the Five Element Smoothie (to be featured in an upcoming post), and the Lemon Routine (see below) that’s used to fight infection. There are multiple ways to get more of this citrus fruit into your diet—use lemon juice in place of vinegar in salad dressings, drizzle it on steamed veggies, add it to soups, sauces, dips and desserts—it lends itself to both sweet and savory foods and recipes. Ayurvedic medicine believes a cup of hot water with lemon tonifies and purifies the liver, and aids digestion, the immune system, and skin, so it serves as a good way to start your day. A cup of hot lemon water can also be used at the end of dinner to help curb the urge to overdo during the dessert course (more on lemon water in an upcoming post). Plus, the juice affects the pH level of your mouth and helps kill the bacteria that cause bad breath—just be sure to drink anything containing fresh lemon juice through a straw to help protect tooth enamel from the fruit’s acid. The single most important factor in treating all types of infections is to improve your elimination system. Infections love a toxic place to proliferate, so anything you can do to clean up your inner environment is key to regaining/maintaining health and vitality. This simple routine is recommended for those wanting a natural way to support the body in dealing with infections. It relies on the body’s largest organ of detoxification and elimination—the skin. Take a fresh lemon and cut it in half. Make a “tea” by squeezing one of the halves into a cup of hot water and drink the mixture. Take the other half and rub the cut edge all over your body— arms, legs, abdomen, EVERYWHERE (well, almost everywhere!). After the lemon has been applied to the skin, climb immediately into a bath with water as hot as you can tolerate. Stay in the bath for 15 – 20 minutes. Before doing this, make sure you are properly hydrated; the lemon juice on the skin will cause the pores to open and the hot water will cause excessive perspiration, so you need to be sure the body has ample fluid during this sweating process. Also, by the end of the soaking period you may feel sapped of energy, so if you are in a weakened condition make sure someone is available, if necessary, to help you out of the tub (you certainly don’t want to be found two days later in a tub of cold water, all shriveled and covered in lemon juice, by paramedics or someone else. Now that would get the neighbors talking!). When the bath is finished, wrap yourself up and stay warm. You may continue to perspire for some time. This routine causes improved elimination through the skin and the bowel, and is most important in the treatment of infections. Many times it will bring on a healing crisis and the person will feel better immediately or by the next day. Another soak that promotes a good sweat can be made by putting a few handfuls of baking soda, crystal salt, and dried seaweed into an old sock and placed in your bath water. Before getting in to soak, rub the soles of your feet with additional salt. Or, if your main concern is breaking up phlegm, try adding ¼ cup of powdered ginger to a tub of very warm water (try drinking a cup of cinnamon tea with this soak). Also read my post on lemon water, which contains even more ways to use and benefit from lemons. Lemon Water: Better Than Lemonade!